Teriyaki (照り焼き, テリヤキ) is a method of Japanese cooking in which sliced meat or fish is grilled, pan-fried, roasted or broiled in a special sauce made from soy sauce, sugar, mirin (sweet Japanese rice wine) and sake (rice wine). The word “teriyaki” derives from the word teri, which refers to a shine or luster given by the sauce, and yaki, which refers to the cooking method (grilling or broiling). In the traditional way of cooking the meat is either dipped in or brushed with the sauce multiple times before completion. Originally the sauce was applied in the last stages of cooking, but more recently it is also used as a marinade before cooking. In the West, the term “teriyaki’ is used for any dish made with a teriyaki-like sauce, which often includes additional ingredients such as garlic and sesame oil. Many bottled teriyaki sauces are available in supermarkets, but the sauce can easily be made from simple ingredients. Most of the well-known dishes of modern Japanese cuisine appeared during the Edo age (1603 – 1867), when urbanization, changes in agricultural methods, and exposure to new ingredients from abroad gave rise to new styles of cooking. Food historians believe that teriyaki was first made by Japanese cooks in the seventeenth century, along with other dishes incorporating roasted or grilled meat. The special sauce distinguishes teriyaki from other recipes. Teriyaki dishes became popular in the United States during the 1960s, when Japanese restaurants began to proliferate. Teriyaki chicken, pork, beef or fish remains a popular Japanese dish in the West. Many variations of teriyaki sauce have been created, and modern chefs use the sauce with novel ingredients to create new teriyaki dishes. The luster or shine of teriyaki comes from the mirin or sake, and from the caramelization of the sugar. Proper preparation of teriyaki involves repeated applications of the sauce during the later stages of cooking until the sauce thickens and acquires luster, but does not burn. Meat can also be marinated in the teriyaki sauce up to twenty four hours before cooking. Teriyaki dishes are usually served with steamed rice which is eaten with the excess sauce. In other cultures, the term teriyaki is often used for any dish made with a teriyaki-like sauce, including those with additional ingredients such as garlic (which is uncommon in traditional Japanese cuisine) or sesame. Many of the bottled teriyaki sauces on the market are actually a version of the spicier Korean bulgogi sauce, which also contains hot pepper. Sometimes a meat will be grilled first and then a sauce poured on afterward, but this is not a traditional way of cooking teriyaki. The key ingredient in teriyaki sauce is mirin (Japanese sweet cooking wine), which has been in use for over four hundred years. It is a thicker, sweeter version of sake (rice wine) which is made by fermenting steamed mochigome rice, komekoji (rice yeast), and shochu (Japanese liquor). This fermentation produces sugar as well as alcohol. The sweeteners in the mirin adds luster to the teriyaki sauce when it is cooked. Mirin is available in most Asian markets. It is clear or light gold in color and is usually sold in bottles. There are two types of mirin: hon mirin (contains almost 14 percent alcohol) and shin mirin (contains one percent alcohol but has a similar flavor and is more commonly used). 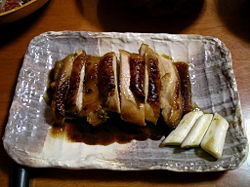 If mirin is not available, it can be replaced in teriyaki recipes with a mixture of sake and sugar. Bottled teriyaki sauces can be purchased at the supermarket, but an authentic teriyaki sauce can easily be made from simple ingredients. Combine all ingredients in a small saucepan over medium heat and stir until sugar is dissolved. Use immediately or cool and refrigerate. To prepare a teriyaki dish, dip thinly sliced meat or pieces of fish or shrimp in sauce and grill or pan-fry. Coat the meat with the sauce several times during cooking and allow to thicken and become shiny. Combine all the ingredients in a saucepan and stir over medium heat until the brown sugar is dissolved and all the ingredients are thoroughly blended. Use as marinade and for basting. Andoh, Elizabeth. Washoku: Recipes From The Japanese Home Kitchen. Ten Speed Press, 2005. Dekura, Hiedo and Danny Kildare (Photography). Sushi and Sashimi and Teriyaki and Tempura: Nuevas recetas de la cocina tradicional Japonesa. Editorial Diana, S.A., 2005. Emi, Kasuko. Japanese Food and Cooking: A Timeless Cuisine: The Traditions, Techniques, Ingredients and Recipes. Lorenz Books, 2001. Hosking, Richard. A Dictionary of Japanese Food: Ingredients & Culture. Tuttle Publishing, New Ed edition, 1997. Kurihara, Harumi. Harumi's Japanese Cooking: More than 75 Authentic and Contemporary Recipes from Japan's Most Popular Cooking Expert. HP Trade, 2006. Tsuji, Shizuo. Japanese Cooking: A Simple Art. Oxford University Press, USA, 1st edition, 1980. This page was last modified on 20 November 2015, at 15:10.